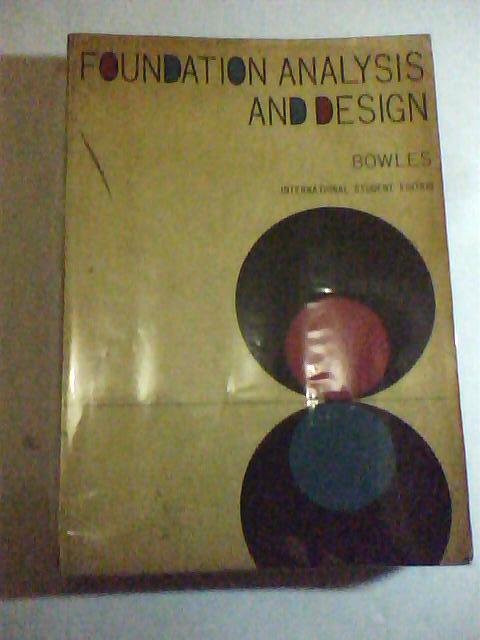 This text is intended to present the currently accepted theories and practices of foundation analysis and design. Some of the newly developing ideas are also treated where, in the author’s opinion, they have merit. This book presents material on both the soils engineering and structural design aspects of various types of sub structures, for the foundation engineer must be well acquainted with soil mechanics theories and their limitations, in addition to structural design principles. It is. generally conceded that foundation design is more an art than a science because of the uncertainties associated with the soil part of the foundation system. This text, however, emphasizes the science aspect over the art, since this seems to be the general educational trend and since art is a product of experience and within the amount of classroom time available is not easily acquired. The limitations and assumptions used in developing a theory or method are pointed out so that the user may, hopefully, obtain some feeling for the precision of his solution. Slide-rule-computation” precision is amply adequate for foundation problems; however, to facilitate checking, numbers should be carried to as much precision as practical, a technique followed in most of the example problems where a mathematically justified number of significant digits is noticeably lacking. The author frequently used the electronic computer or a desk calculator for computations, for speed rather than increased precision, except in cases where large numbers of equations are involved; in these cases both speed and round-off errors are important. A textbook should present theories, examples, and practice problems of reasonable simplicity to allow the user to acquire some feel for the theory. Of necessity, many of the theories have been considerably condensed; however, the pertinent references have been cited so that the user may research the original source if greater depth is desired. A generous number of examples has been included, and in cases where more than one theory or method may be used to obtain an answer, the examples are presented so that a comparison of the methods can be made. I have not intended this text to be a survey of the literature, but with, the wealth of material now published in the area of specialty of this book, a fairly extensive bibliography is required to supplement the material presented. Certain bibliographical sources were cited for historical purposes, and were not actually used in the preparation of the text. Generally, these citations are noted in the text. In cases where cited references contain extensive bibliographies which are applicable to the topic under consideration, appropriate note is made in the text, in preference to adding a large list to the text bibliography which contributes little to the text material. The text provides sufficient material for two three-semester hour courses. Material ranges from the simple to the very complex. The text is also arranged so that either soil mechanics or structural design may be emphasized or a balance obtained. For the instructor an adequate number of problems is supplied at the end of each chapter, with answers or partial answers for certain of the problems. Where applicable, the computer has been used to obtain tabular values and answers for problems. Certain of these programs (in FORTRAN language) are included in the Appendix, so that assignments may be made of the advanced problems which require the use of a computer without the necessity of preparing and debugging the programs. Instructions for the use of the programs are available in the text, so that the programs should be convenient even for the user who is not familiar with computer programming. Much of the text material has been classroom-tested in the author’s courses at both the undergraduate and graduate levels. The practicing engineer should find this text a useful design aid because of the large number of examples (worked in considerable detail), the end-of-chapter problems, and the computer programs. There is also a considerable amount of tabulated data, which makes the text a convenient reference source. The classical and empirical methods of foundation design have been presented, as well as the newer mathematical formulations, such as finite differences and the three-dimensional analysis of pile groups. Both working stress and ultimate stress design methods are given for reinforced concrete structures. Problems involving steel design are based on the methods demonstrated in the sixth edition of the Steel Construction Manual (AISC). The author wishes to express appreciation for the direct assistance in preparation of this text to his several graduate students, especially Ronald Fedderson, Bruce Weber, and Mark Wallace. Mr. O. P. Sharma, former Extra Assistant Director of the Indian Standards Institution of New Delhi, made a special contribution while a graduate -student during the text preparation. Mr. Avron Rothstein of the Bradley Computer Center was most helpful in providing access to the computer and, in debugging the programs. The author is also grateful to Dr. Charles G. Salmon of The University of Wisconsin, who reviewed the entire manuscript, Finally, the author would like to express appreciation to Dr. J. O. Osterberg of Northwestern University and to Mr. Clarence W. Dunham, Consulting Engineer in Hamden, Connecticut, who reviewed major parts of the manuscript. Special thanks are due Mrs. J. E. Bowles, who typed all the material several times to obtain a satisfactory final manuscript, assisted in proofreading, and provided general encouragement to the entire writing project.